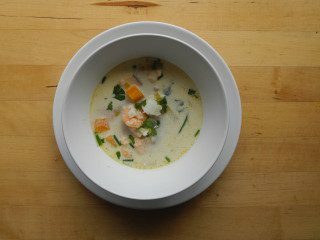 With Christmas fast approaching, our professional taster of Norwegian food, Luke Slater, presents three special editions of his much loved food column. 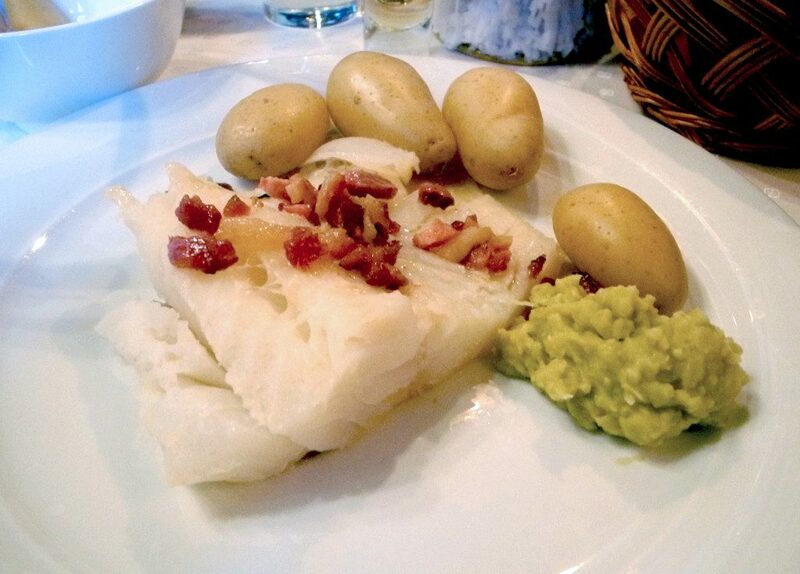 First out is Lutefisk – a dish with long traditions. “Gelatinous” is not a word that will make the mouth water. As an Englishman, my instant food-related word associations are tripe and that filling between the meat and the pastry in a pork pie. Both are hardly delicacies, or at least anything to be recommended to people you like. 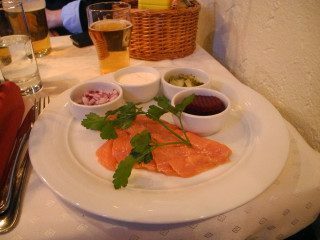 But “gelatinous” kept being the adjective of choice for lutefisk, one of Norway’s many traditional Christmas dishes. Apprehension was the feeling that I experienced when I realised I’d be eating it in a matter of days. 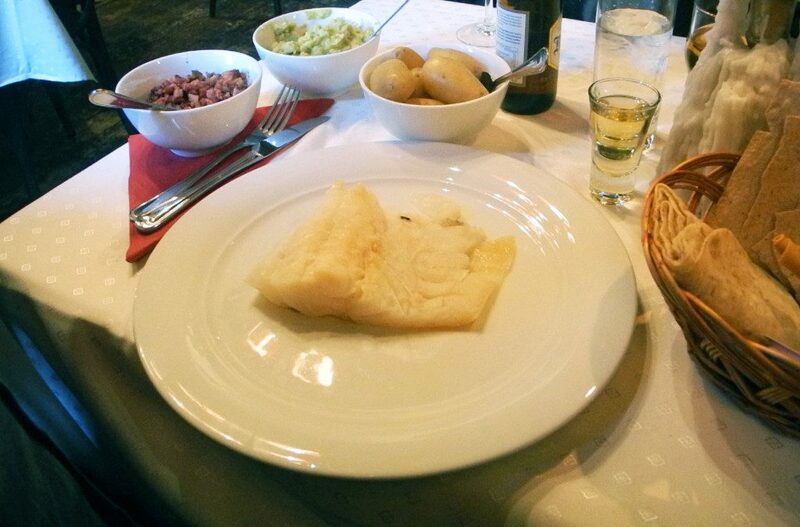 Lutefisk is quite literally food of Norwegian legend – its origins are not entirely clear, though there are many, many stories. 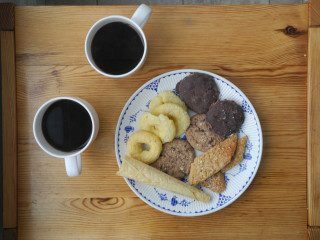 Although now is the time of the New Nordic Cuisine and a soaring culinary reputation in the far north, a lot of Norwegian Christmas food is the antithesis of that – seemingly ancient and perhaps basic but definitely wholesome and filling. Lutefisk is essentially dried stockfish (usually cod) which is then treated and soaked in lye (or sodium hydroxide) and cold water. I sat down and prepared myself in a classic “julebord” setting of Lorry’s in Oslo. I was intrepid. It’s not that I’d heard horror stories, more that I’d imagined them. I was reassured, though, when a local told me that if lutefisk is done correctly then it shouldn’t be gelatinous – you should still be able to make out the flakes of cod. All I had to do was cross my fingers and hope for a competent chef. Not long after this discovery, my lutefisk arrived. It was much larger than I was expecting and looked like the more appetising photos I’d seen on various Norwegian cookery websites. A closer look revealed visible flakes in the fish, which set me at ease. I wouldn’t be eating mushy cod with mushy peas. My nervousness subsided further when the first flake entered my mouth. Yes, it was a little wobbly (for consistency think half-way between jelly and partially melted brie) and tasted like it had, at some point, been treated in something potent. But it was like nothing else I have tasted. 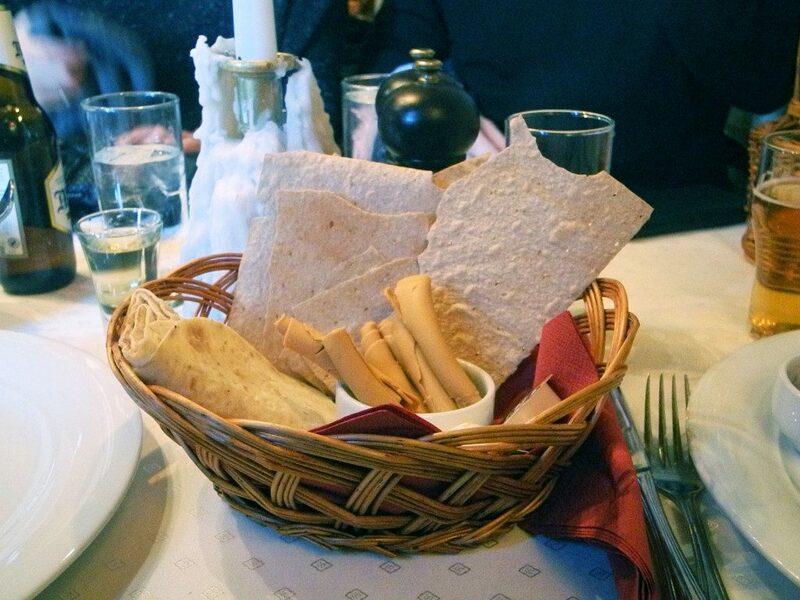 A little while after digging in I could see why lutefisk has remained a popular Christmas dish throughout the ages. It was so filling, especially when served with new potatoes, mushy peas and fried bacon pieces. It was a struggle to finish. The presence of small rolls of brunost was a little confusing, even for my Norwegian friends. Apparently, you chomp on it after each bite of the fish. Naturally. But even this oddity resulted in another tick for the versatility of that caramel-coloured cheese. “Lutefisk: it tastes a lot better than it smells” might not be the most encouraging way to sell the dish, but it might be the most accurate. Just remember to have a Christmas drink nearby to wash it down. Just in case.